A short 3 hr drive (120 Km from Bangalore) is the town of Madanapalle.Head to old Madras Road and after the 1st toll near Hoskote take a left and get off the highway. Madanapalle is famous for its mangoes, fruits and vegetables and is the biggest tomato market in Asia. Horsley Hills the highest point of Andhra – a hill station is just 25 km from here. Set in the midst of the E Ghats, rocky hills and lakes the landscape is rustic and captivating. If you leave Bangalore at 5 AM you can be blessed with a divine view of the rising sun as you drive into Madanapalle. My purpose of visiting was to stay at the Satsang Foundation – the HQ of Spiritual Guru Sri M. Sir is a living Yogi, a spiritual guide, social reformer and educationist. I had read his autobiography about 6 years back and met him at a discourse on Karma Yoga. His presence was electrifying. My first two visits to the Satsang Ashram were day trips. It was during my last visit (Thanks to a good friend for making that happen) that I had the joy of meeting him in person. He suggested that I visit the Ashram frequently . This was my first trip where I spent 2 days at the beautiful ashram. Its a small and divine ashram. 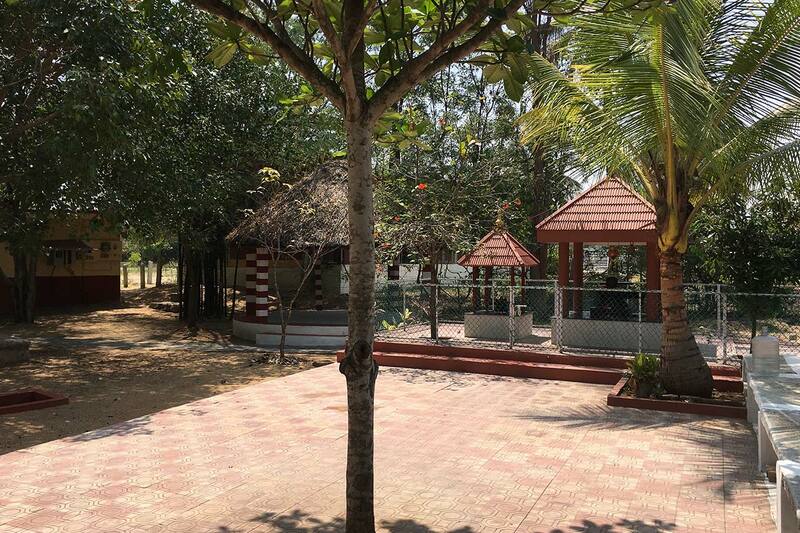 The centre piece is the Shivalaya – which is a serene place housing a statue of Ganesha , Shiva Linga, and the Sri Yantra besides a beautiful peepal tree. This is where the group meetings and the functions are held. There are two energised meditation rooms – the Babaji meditation room even in the summer heat felt cool and comfortable. These are powerful centres and a 30 min session here feels like meditating for hours. The rest of the Ashram has rooms , a dining hall, a meeting room and the administration office. The rooms are spacious, airy, clean and functional. Bathrooms have W Toilets and hot water. Many who revere Sir as their Guru have built their houses in the Ashram. Sir also has his house here. The Foundation runs a school and a healthcare centre that are alongside. This is not an Ashram where you will be woken up with devotional songs nor are there evening Bhajans. The place was almost empty – its a place to go within and connect with your inner self. The Satsang Vidyalaya – provides free, high-quality, multi-lingual education to rural children from the tribal areas of Andhra Pradesh. I met the school principal as he was waiting at the gate welcoming the students. It was a joy to see the high energy students trooping in – some walking , some cycling and some running in at the last minute, all of them stopping by and greeting us Good Morning . The school was spotlessly clean. Most of the teachers have a Masters degree , many are B Ed and one of the volunteers is a microbiologist from Harvard. The students are mainly from the local Lambada community. The Satsang Swasthya Kendra is a very well stocked, well managed centre. Run by an efficient doctor and her competent team – the place is spotlessly clean and feels like it was inaugurated yesterday. But its been there for over 5 years delivering excellent service to the local community. The ashram also has a woman self help centre – but it was closed and I couldn’t visit them. The Admin office has an excellent stocks of DVD’s and Books – Sri M communication is simple and lucid and his explanations of the Upanishad and Bhagwad Gita is a joy to listen. I stocked myself with almost all that they had to offer. The food at the Ashram is simple and Sattvik. You will love it. I spent a lot of time at the Ashram – but I also had time to go with Dr Priyam and her team to the villages nearby. Our first visit was to a mobile health camp run by the Govt of Andhra with the Piramal foundation. I was impressed with the process and the efficiency with which this camp was run. Cheers to the committed team of doctors and their support staff. Our second visit was to the Satsang rural school that imparts education to about 30 children. This is located 12 km from the Satsang Ashram. This is where you see the difference between city children and the rural kids. There was so much joy and happiness in the little things they had. Intelligent , sharp kids with great life skills – but sadly at a disadvantage from day 1. The Satsang foundation has clearly identified the two pillars for India to succeed – Education & Healthcare, without that India cannot progress. I also found time to visit the local village market (Tue is the day to go) and eat the tastiest Idlis and Vadas at CAM’s idli. Needless to say a plate of idli , Vada and Dosa cost me less than Rs 50/-. A 20 min drive from the Ashram is a beautiful Shirdi Sai temple on the Kadiri Byepass road. Its spotless clean and has a live “Dhuni”. Mallaiah Konda – which I was told is a beautiful place with an ancient Shiva temple. This is a hillock located off the road from madanapalle to Bengaluru. This is a hillock with a large monolith at its peak. On top pf this peak is a temple of Mallikarjuna Swami (Shiva). One can reach this place by taking a left turn near Vempalli village, while travelling from Madanapalle to Bengaluru. Luckily, the place is still pristine even though it is located near the town. It offers beautiful views of Madanapalle town. One can also see the surrounding Mahamalleshwara hills. The flat area found on peak of the hillock is an ideal location for stargazing during clear nights – best in summers. Obalesh Temple: A Vishnu temple located on the same road, but still farther towards Bengaluru. This place is located inside the state of Karnataka very near to the border it shares with Andhra Pradesh. It belongs to the rayalapadu panchayat. Unlike the malliah konda, this temple is not on a peak, but is nestled between two tall hills. A good place for silent contemplation. Every Saturday bhajans happen in the temple from morning 7 to 10 am. There was another Vishnu temple I saw atop a hill from the Ashram – this is a trek with about 600 steps. Rishi Valley – Once a drought ridden valley, but now a throbbing forest. Thanks to the Krishnamurthi foundation which has taken upon itself the task of afforestation in this valley and has done it successfully. Rishi valley is famous for the School. but, deep inside the valley one can find pristine locations, which I feel, equally deserve the fame. One such location is the Enugu Mallamma cheruvu. A natural percolation pond. One can enjoy a swim in the pond and also enjoy the view of surrounding hills. Peepal Grove School (PGS) – a residential school run by the Satsang Foundation – It is one of the few schools providing alternative education in India. There is also an organic farm close by that merits a visit. Horsley Hill may be worth exploring – I am told that during weekdays its empty. The weather in Madanapalli is excellent between Oct & Feb. Summers can get hot. The area gets only a few showers every year and water is a challenge. There were no power cuts when I was there and I was told that things have got a lot better in the last few years. The network is decent – Airtel 3G works but Jio doesn’t. It is time for me to meet him. We should unite together for the Golden World. Would you like to guide me? I want to meet him at Gurupurnima at 27th July.